What does a best practice reconciliation system look like? 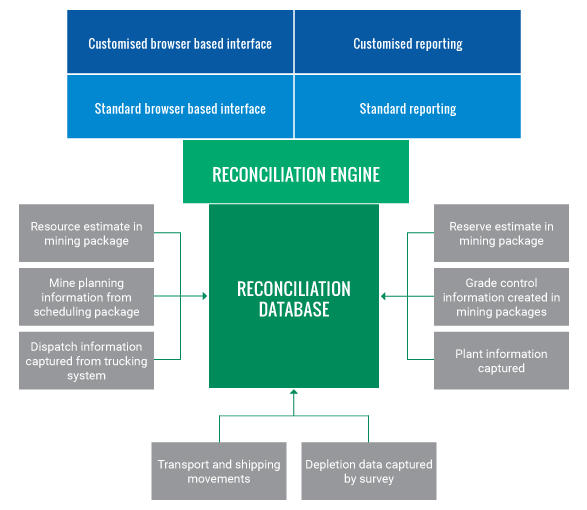 Mine reconciliation touches on a number of systems and personnel across the mining value chain. This is one reason why reconciliation-driven improvement is challenging. The architecture diagram below depicts how a generic solution for a reconciliation system could look. Any reconciliation system needs interface with all these various systems and feed to a central reconciliation database. To support confidence in analysis of any numbers there should be a suite of business rules applied to the imported values to ensure the quality of the data coming into the system is trustworthy. The old saying “rubbish in, rubbish out” is extremely important in this work, particularly given the number of different systems (and often calibrations) involved. Within the database it is important to tag the data from each system with a common mapping convention to enable comparisons to the highest possible, reasonable level of resolution. Where available, information should have common location levels (i.e. bench, digblock), material types, rock types and time period. The front-end of the system needs to allow the user to produce reports, demonstrate trends, identify exceptions (areas of concern) as quickly as possible, and to drill down to isolate the root cause. Comparisons across the entire mine value chain should be easily available to all personnel, by location or time periods, on any day of the year. Reconcilor has been configured to address all of these aspects out of the box. Visit our Reconcilor page for more information, or contact us at snowden@snowdengroup.com to arrange to speak to our reconciliation experts or arrange a demonstration.